When Da Vinci Real Estate had a great idea to turn an old photography studio into a co- working space, I was so excited and wanted to be a part of the project. The 100 year old building had gone through a few transformations over the years, including the local newspaper building and was John Running's photography studio for many years. The client wanted a clean, modern and open space that was comfortable, professional and a creative fun place to work. The building had a lot of original elements including vinyl floor tiles, concrete pillars, skylights and a tin ceiling. Over the years the space had been partitioned off with multiple walls so the space was dark and compartmentalized. We opened up the space and installed Flor carpet tiles in various colors and patterns to warm it up. 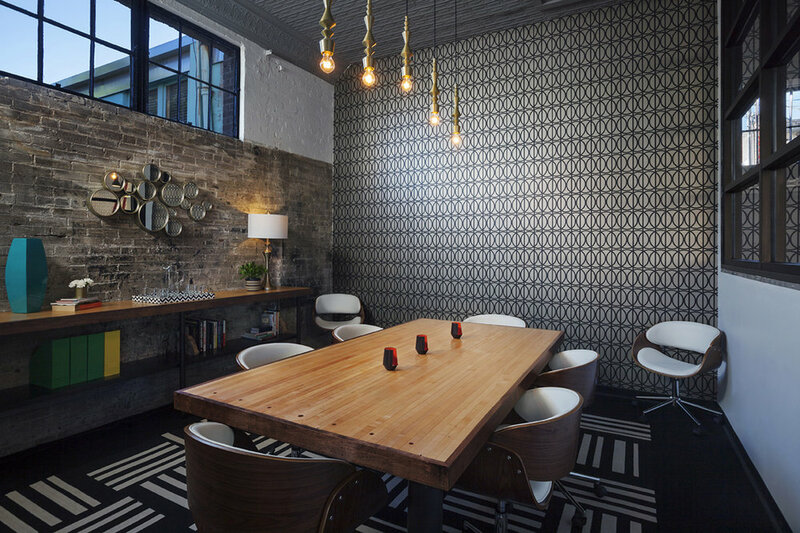 Old bowling ally lanes were repurposed for a communal work station, conference table and kitchen bar. A conference room was added with glass panels, wall paper and a custom made metal barn door from Silvertone Fabrications. During construction we uncovered an old elevator which is now a call room for having a private conversation. Power in the middle of the room was challenge as we couldn't plumb through the floor. I had the idea of building a divider with conduit and wood slats that would serve as a decorative element as well as solve the electrical issue. There was also a huge window that was bricked in over the course of the buildings history so I found textured wall panels and filled the space with them. The end result is a modern loft space. I love the space so much that I have a desk here!